I visited this site to see what people were saying about the PW-2200 (v.1). I purchased this sub new 16-17 years ago for around $500. It's the only sub I've ever owned. I originally bought it as part of a complete Paradigm 5.1 system which I replaced about 10 years ago with a set of Martin Logan electrostatic spkrs (Vantage mains/Clarity surrounds/Cinema i center). The sub blends in as nicely with the MLs as it did with the Paradigms. It's now in a soundproofed (14' x 20') basement theater room. I rarely watch blurays at a volume equal to that of your average cinema, and while you can't hear the soundtrack outside the room, you can often feel the base from this sub all over the house. I've never noticed any distortion from PW-2200 with movies or music, and the base never sounds localized (the sub is placed next to my equipment rack inside of the left main spkr). If you're thinking the PW-2200's 250-watt amplifier is inadequate, I use a Lexicon LX5 200w per channel amplifier to power the MLs and the sub has never struggled to keep up. Based on the PW2200's performance, price and longevity (16+ years and still going strong) it more than deserves a 5-star rating. Bought a Paradigm set-up/package on Craig's List that seemed to good to be true. Two Mini Monitors, CC-370, Two ADP 370's. with Paradigm stands. $500. He told me it has an " Awesome Sub " too. Just before I left to pick " The Deal " up, I asked him the Model of the Sub. He said a " PW-2200 " Ya, after hooking this Side Table up, he got it right. The thing never complains, it just shakes the fake shutters on the outside of the house. I'm actually going to remount them. Didn't have that problem before. Oh, did I say Problem? Very good price for quality, loud, deep and well controlled for a 12" bargain sub. I am yet to see any except for the fact that my new neighbour freaks out when I play it loud. Apparently he can't hear his tv or something. I have had this sub now for about 2 months. When I first got it I had some real issues with setting it up as most people seem to. After about 3 days of trying settings and moving the sub all over my room I ended up putting it in a corner (I like loud bass). I then put the gain up to about half. I have the new version of this sub so it actually has 500 RMS watts and about 1500 peak. Needless to say it is incredible. After about 2 or so weeks of playing it every day it got even better. I would imagine I had about 50 hours on it maybe a few more and it got louder and deeper. I have nothing bad to say about this sub, I paid a good price and got amazing performace. I suggest this sub for anyone who wants big sound without going broke. I havent had to deal with any issues yet but the sub has a 2 year warranty and I live in canada about a 15 minute drive from where they make paradigm speakers in missisaugua. So if I have any problems my dealer ships it out and I get it back in a week no questions asked. Enourmous bass, tigh, powerful. It will rattle your walls!!! Endless power! I can't think of any??? Well, after having this sub for approx 6 months now i'm very happy. This thing is phenomenal when i consider what i paid for it. To be honest, i think its worth more then what i paid. I currently own the Paradigm Reference Studio 100's V2, and matching Reference CC-470 center and ADP surrounds. I was looking for a sub for home theatre, since I was more then happy with the output of 100's for stereo listening. I was set on buying the reference servo 15 since i thought this was the best option to match my system. When i went to audition, the salesman at EHR actually talked me out of buying it and asked me to audition the PW2200. At half the cost i was amazed listening to this sub, it is incredible. I have a large room, approx 18' x 24' of which i have my theater set up. This sub easily and i mean easily fills the space with MASSIVE bass!!! It pounds with such authority that even 6 months later it still puts a smile on my face. Awesome for movies! Before i auditioned this sub i also listened to the B&W 12" model, not sure the model name, Velodyne 12" and Energy 12". Sorry, i don't know the model #s. I can say without a doubt that these subs don't hold a candle to the Paradigm. The other great part was that the Paradigm even sounds 10 times better in my home then it did in the showroom. Long story short....Paradigm PW-2200 V.2 2005 model. Great sub, great value. I don't think their is anything in its class that rivals it, not even at twice the price. I tried to be critical, but their is really nothing bad i can say? Massive bass, deep crisp and clear. For the price I would put it against subs 3 times as expensive. Big, but hey I guess thats what it takes to produce big bass. great slam on movies music comes alive with amazing base this sub rocks!! humming noise coming out of my sub. when working properly this sub is amazing. bought store demo very powerful on movies very thigt on music but after 20 minutes sub started making loud humming noise. turned off receiver hum persisted. Bass, Bass, Bass, beautiful build and aestethics. This is a big box so you will need room for it. Give at least a foot on the back and plenty of room on either side for the best performance. The first thing I wan't to say that the $900. is in Canadian pesos, not American real dollars. This was all taxes included. This sub absolutley rocks. Right out of the box this sub totally out performed my old PS-1000. Just as the previous reveiwer stated, it took awhile to break in. At first it sounded flat and unresponsive but it just opened up after about 20 hours and holy crap did it ever. The bass in this baby hits your chest and shakes all the loose plaster off you walls and ceiling. It's incredible. I knocked a couple pictures off the wall and I'm running the cross over at 80 Hz both on my reciever and on the sub. There is no need for fiber in your diet with this sub as it will shake the s@#t out your bottom end. I was absolutley astonished with the difference from this sub compared to the PS-1000. A completely upper class sub. I have heard the Servo-15 and that is an excellent sub, but at half the price this sub comes close to it's punch. I can't wait to hear what this thing will do after it's completely broken in. I use my system for both music and movies and I'm sure that I won't be dissapointed with it's performance in both spectrums. This baby has 400 watts of power that is available, all you have to do is step on the accellerator and away you go, but be carefull if you do not have the right gear to drive it. You could toast your mains and satellites. My System is crisp, awesomely detailed with excellent midrange, and extremely deep bass. I'm not to worried about my system as I running...... DenonAVR-3803 reciever Parasound HCA-855 High current amplifier, for my mains only as they are 6 OHM, the rest of my speaker package is 8 OHM. Paradigm 11se's for mains Paradigm LCR-350 center Paradigm Mini Monitors for surrounds Paradigm Titans for rear surrounds Paradigm PW-2200 subwoofer Paradigm PS-1000 subwoofer Monster HTS-2500 Power Conditioner, this was an excellent investment considering the high density population area that I'm in, it really does work. I'm using all the best Radio Shack interconnects that they offer. I did a A-B test on Monster inter-connects and I found that the product was inferior to Radio Shack. Monster has an excellent marketing program that will, and has given them monster profits off niceley packaged and pretty products, but let's be real, wire and cable pretty much come off the same spool. I've talked with professionall installers and they have verified this. If anyone want's to dispute this, check out the web site at Audioholics.com and get their opinion on over priced interconnects. You will be either astoninished or embarrassed because you spent far to much money that you could have spent in other areas. I had one salesman tell me that he had spent $600 a foot on interconnects and I reallized that I was standing in front of the most foolish and gullible man that I had ever met. As far as the Sub goes It's the best Bang for your buck that you can find. If you can afford this baby, don't waste you time looking elsewhere. This will satisfy you for years to come. It took awhile but huge clean output. Very musical and Very punchy. I know all rooms have there problems but for my room corner placement is awesome. It is big but who cares, it pounds! Throughout this review I will be describing differences between my new pw2200 v2 400 rms sub and my last sub which was a ps1000 v3 175 rms. I have had many paradigm speakers in the past to know not to judge them until fully broken in so with my review you will not be getting some hasty review by someone who plugged it in then wrote a review. I will be describing sound quality and quantity from day one. Day one, I set it up with my receiver crossing over 80 hz on up to my mains center and surrounds and 80 hz on down to the sub. First impression: my old ps1000 pounded way harder. I have to admit with a band pass enclosure such as the ps1000 each watt means something, it is designed with output being its best quality. I looked at the woofer of the pw2200 for the first couple of songs and I noticed alot of woofer movement with not alot of sound quantity. Not to panic, I have broken in many paradigm speakers in the past so I know things will change. I listened to music for about 2 hours first day with no apparent change. Day 2: tried a few movies at medium volume, still did not have that bass impacted presence that my old ps1000 had with movies, finished day 2 listening to music and started hearing a cleaner tighter sound then what I was used to with my old ps1000. Day 3: I started listening to music at a higher volume, not cranked, but louder then the first couple of days. Now I have put about ten hours on it. I would look at the woofer while in play and still saw alot of woofer movement compared to sound quantity. Keep in mind I do have a rad shack sound pressure meter so I was calibrating my sub every day. Day 4 5 6 7 noticed very gradual increases in sound quality and quantity. Week 2: Normaly, every paradigm speaker that I have had in the past was usually broken in by the end of the first week, about 20 hours. Not this one and I have to admit I was starting to wonder. I asked my wife to play music all day if need be while I was at work to hurry the process along. Everyday I was getting gradual improvements and then all of a sudden during week 3 about 40 to 50 hours this sub just came alive. It was clean, fast,clear, and it just started pounding with complete authority. It was now broken in and it was completely spanking my old sub. The bass impacted on my chest and on my furniture was like nothing I have experienced before. I know my old sub was a 10 incher and my new one is a 12 incher so the end result is kind of obvious, but it sure to awhile. Quality: my old ps1000 was sure a one note wonder, lots of output but just one note. New sub pounded WAY harder with excellent bass transition between notes. My receiver could transfer bass at 80 100 120 and 150. My ps1000 would sound god awful at 150, terrible at 120, not very good at 100, and only barely acceptibe at 80 hz. If only my receiver would do 60 hz I am assuming it would be very good. I can not say for sure. I tried my pw2200 at 80 100 120 and 150 just to see how it would react and I could not believe how awesome it sounded at all those crossover frequencies. This sub is very powerful, all my music and movies have unbelievable amount of punch. Sound quality is like nothing I have heard before. Now when I look at the woofer while being played, the woofer movement now matches the output. I know people have said that this sub does not sound good in a corner, I disagree, my old ps1000 sounded very bloated in a corner but the pw2200 sounds very good in the corner. If anybody can not afford the pw2200 and can only afford the ps series, keep this in mind, it will sound better the lower it is crossed over. If you have a ss reciever that can cross over at 60 hz and you have very capable mains center and surrounds, the ps1000 or even better the ps1200 will most likely be an awesome combination. The THX spec of 80 hz "not that this means anything" is just to high for a bandpass enclosure that is a one note sub. If you want a sub that does many bass notes and absolutely pounds with sheer authority I highly recommend the pw2200. 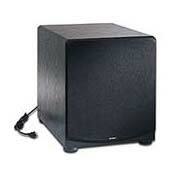 Shakes the house foundation, 400watts RMS, 1500watts max.., Goes below audible range. Seamingly endless power supply. Not all dealers have the product in stock. Won't get pessimistic to find a flaw. I had been in the market for a new sub for about 6 months. I have a pair of 1979 JBL L212 speakers. It was the 1st year that a satellite subwoofer was made, Anyway the speakers are still wonderful sounding, I'll put them up against anything under $1800.00 except paradigms. Back to the subwoofer it sounded very good but I had been noticing that something was missing, lack of punch, dynamics, low end 22hz & lower. I also noticed that when watching Pirates Of The Carribean when the governors' daughter falls into the water, when the necklace almost comes off, the low, & I mean low end bass made a popping sound on my sub. Checked my associated equipment everything was okay there. Bottom line is that my old sub cannot do the job anymore. I have read all of the reviews regarding paradigm studio series equip. & subwoofers. I went out to my dealer to check out my future sub. My dealer set 3 of them up for me, a velodyne sub with a 12" & 10" woofer, B&W 12", and the PW2200. Sorry didn't get the models off of the other two. (Not worth the time). After approx: 2 1/2 hours of listening to a whole lotta bass, there was no competition, The velodyne was too boomy & did not articulate the bass lines, as well as it did not have the tight bass that I was looking for, also not as fast as the other two. I also expected a little more from the B&W, but I guess that it's just a testment to the quality of electronics you receive from Paradigm. So to say the least I went with the pw2200 there was no competition. I brought this baby home, had it hooked up and firing in under 10 minutes. First impression was ok, speaker was missing the punch, low end,& sounded very boomy. I knew that it was going to need some time for the break-in, as did my studio cc center channel. As I was breaking it in, on the 12th long day in a row, I was watching Jay & Silent Strike Back; in the middle of the movie were the girls are robbing the diamond store the background music started to get tighter in sound & started to go down llooowww. Then when the ensuing van explosion occurred; My 1st thought was my god I just broke my T.V., it had rattled sooo bad & my picture went black then came back on. Now there was the deep bass I had been waiting for. Subwoofer level is approx 1/3, the crossover is at approx: 75-80hz, this is plenty of low end for my needs. As for the musical aspect, the bass is very articulate, well defined, very low bass passed the audible range to where you can feel it, but not hear it. It is a very fast sub, no it will not do alot of metal or speed metal double bass pedals, Some reviewers would say that it is slow, but it's just that the other subs that are faster in a 12" cost 3 to 4 times as much. The last thing I will touch on is power, it seems that this beast has a never ending power supply, 400watts rms, and 1500 watts peak, ultra high-current class-d. We just had a party this weekend & one of the knit wit goers decided to mess with the controls, I found the sub level at 7/8 of the maximum limit, playing their hip hop music (not my type of music) even then with the sub driven to it's max, it did not faulter, or even think about slowing up, it hit hard, clean, and seems to have no limits on what it can do. Like a reviewer suggested, put your hand behind the flared port and feel the force of the air being pushed through, that is if you aren't already vibrating from the shockwaves. I would recomend this piece to anybody who is looking for a sub, dedicated stereo or HT, you will be pleased.